I know many of you are getting ready to send your kids back to school in less than two weeks. We still have four weeks of summer left, but I decided to get an early start this year after realizing the store shelves were wiped out two weeks before school started. And, I might be a little bored now that I'm not working part-time any longer. Instead of throwing together things at the last minute I'm putting an insane amount of energy and thought into my kids wardrobe and school papers. I'm not sure how I feel about that. 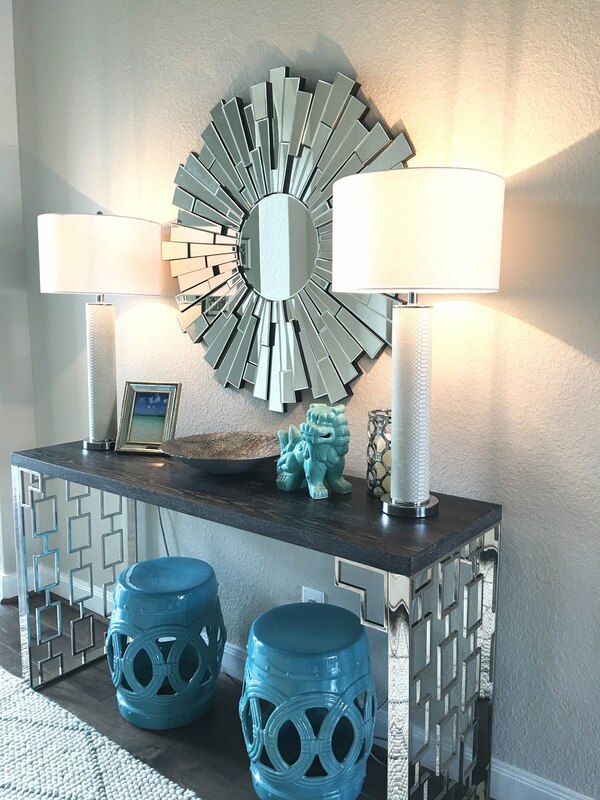 But, if you want to jump on my crazy train of organization then this is the post for you. Clothes Shopping-Fill in wardrobe gaps instead of starting from scratch. $$$ saver too! I start by making sure all of the clothes are washed so I know what I'm working with and weed out the ones with holes or stains. Then, I start to pair outfits. I was surprised at how many of my boys' items did not have anything that matched it and the disproportionate number of tops and bottoms. You can make a list, but it's best to take a picture of the clothing with your phone to have available when you go shopping. It might be a bit more time consuming, but it is a money saver. 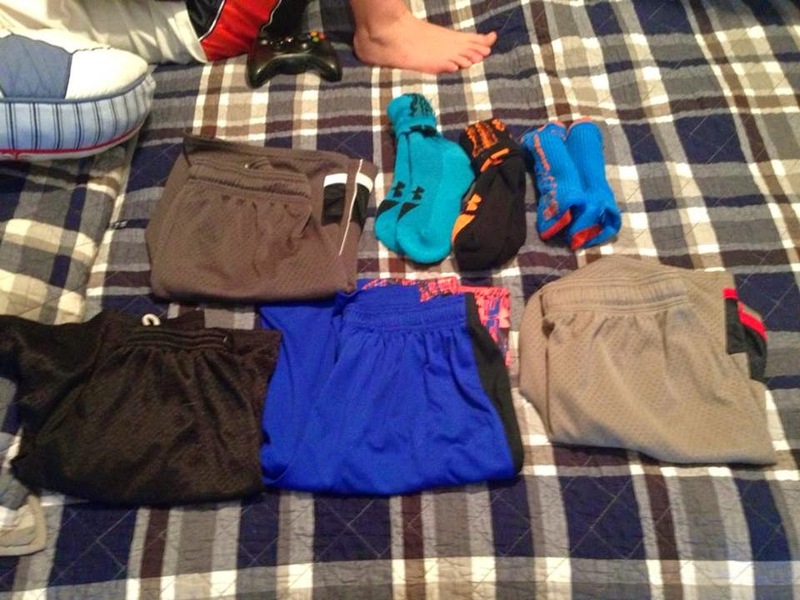 I would have never realized my youngest son only needed two pair of shorts this way, or the exact shade of blue shirt my older son needed to match his ridiculously expensive Nike Elite socks if I didn't have a picture. Clothes Organization-No morning arguments, No wearing the wrong shirt on spirit day, No mismatched clothes, No messy drawers, and laundry is put away fast! Yes, it's that awesome! I have shared this tip before, but it has worked so well that I have to mention it again. Each of my kids have a closet organizer with individual cubbies. Each cubby gets a complete outfit-top, bottoms, underwear and socks. Most of the organizers have five or six cubbies so you only have to pair outfits together once a week. I have my kids participate so we don't get into the "I don't want to wear this" argument. They can grab an outfit and dress themselves on their own while I make breakfast. Laundry is faster because the clothes are folded instead of hung up on hangers. They stay folded too since they aren't stacked in drawers for kids (or husbands) to rifle through. You also don't have to forget what color shirt your child needs to wear during teacher appreciation week or if their spirit shirt is clean since you organize it all before the week begins. Don't be intimidated by this high level of organization, haha. It's easy and it really works! Sorry, I know this isn't the prettiest picture. I do have more than one outfit per cubby since I was going through my son's summer clothes when I took it. It's ridiculous that I even have to do this, but it's absolutely necessary in my house. I know I'm not alone either! Put toothpaste on your kids' toothbrushes first thing in the morning so you can see who actually brushed their teeth. My kids find it funny to blow in my face during a sniff test knowing full well they didn't brush their teeth. I'd rather just take a quick look at their toothbrushes. I also put my older son's deodorant out on the bathroom counter as a reminder to use it. Underwear and sock checks are a must here, too. Pray for me. There are times I could tell by my sons' weighted down shoulders I didn't even want to open their backpacks...ever. But, you need to get to it before they do. If you don't, it will be strewn all over the house and you will find the notice about the important event under the sofa the day after it happened. It's like mail. Stand by the trash can and immediately throw out what you don't need. Put any important dates in your phone calendar or whatever organizer you use. I use my phone because paper doesn't give me auditory reminders. If I choose to ignore the reminder I make sure to re-remind myself at a different time. Take the important papers to one organization center. I need three things-a whiteboard calendar, a pinboard, and a wall file organizer. Important papers get pinned. Papers to keep get filed in the child's folder on the wall. Important dates not only get logged into my phone, but also on the whiteboard calendar so everyone in the family is aware. I go through the files at the end of the year to throw out what I don't need and keep what I do in the office drawer. For example, I only keep the last report card since the previous report cards are listed on it. Artwork gets pinned to each child's pinboard in their room and then gets put into a bin in their closet when the board is full. It really is easy and I'm not sure why it took me so many years to figure this out. I suppose I didn't realize how paper and the amount of events can become consuming, especially the more children you have and extracurriculars they are involved in. It's like managing a business! This is from last year since I'm in the process of moving everything to the new mudroom. I like Pottery Barn's systems, too. Lunches-Save yourself the headache and prepare beforehand. This usually goes well for the first couple of weeks and then I fall off the wagon. It's like exercising. You've just got to make yourself do it because it will be worth it in the end. 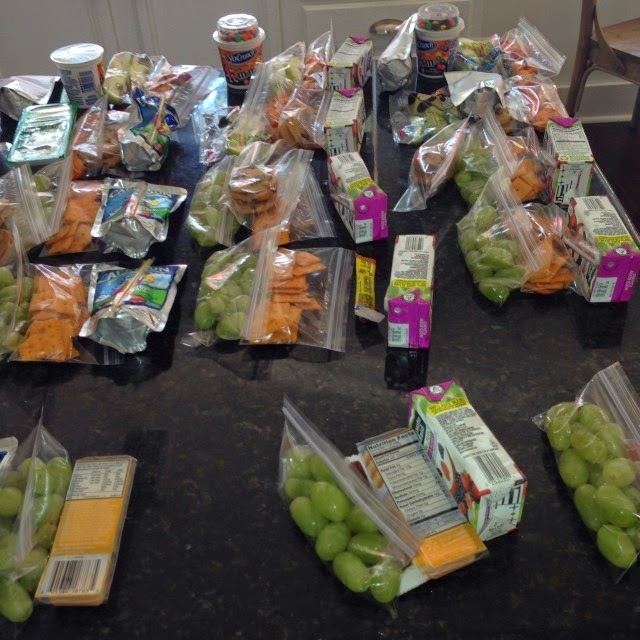 Prepare lunches the night before, but also prepare what you can the week before. Use a vegetable drawer or a bin to separate what will be used for lunches in the fridge and the pantry. It's important so kids don't eat or drink what is reserved for lunches. How many times have you run to the store for juice boxes at 9pm? We have so many times. If you know you will give your kids carrots twice that week then go ahead and separate them out into Ziploc bags so you can just grab them when making lunches. I try to keep them from dipping into the lunch bins by having a snack ready for them when they get off the bus. I usually always have the ingredients for chocolate chip cookies and monkey bread on hand. They will never turn those down, but I also have crackers, cheese and fruit available some days. If they are prepared in a nice way my boys won't turn those down either. It sounds crazy, but even kids notice presentation! This is a week of lunches not including sandwiches since those would get gross made more than a day in advance. I can't believe how much these guys have changed in one year! I'm going to miss them during the day, but I do need to pick up where I left off with projects around the house and I can only do that while they are at school. We're going to try and finish the mudroom before school starts next month since it will be getting heavy use then. Thankfully, there's not much left to do so I think it will happen! Can you believe it's almost time? I remember these days, it goes by so fast. You've got some great solutions for getting three boys up and out on time! Oh, I'm not ready yet! Though, those are pretty awesome tips, I have to keep them in mind!